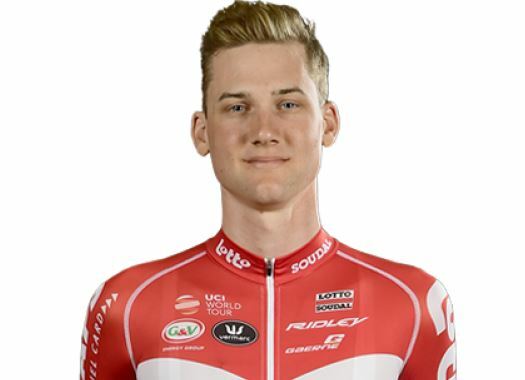 Two-time winner of the BinckBank Tour, Tim Wellens, is returning to the race leading Lotto-Soudal. The team will have several cards to play in each of the terrains of the race. The previously known as Eneco Tour will take place in The Netherlands and Belgium with a course that is suitable for Wellens. "I’m feeling good," said the rider. "I gained confidence by securing the overall victory in the Tour de Wallonie, and it’s always nice to know you’re in good shape. I’ve just completed some intensive training days, so I hope to be totally ready by Monday to start the BinckBank Tour in the best way possible. I’m certainly looking forward to this Tour! "My goal is to claim the overall victory once more, though it will not be easy this time. The stage I usually win, has not been included in the course, so it will be more difficult to make a difference. This year, you don’t have to be a strong climber to win the Tour. My biggest opponent is the type of rider that is a good sprinter and time trialist. The time trial and bonus seconds along the way play an important role in determining the general classification. The first small differences will appear in the time trial on Tuesday and will partly decide the overall standings at the end." "The two final stages are a bit more difficult, but not tough enough to make any big time differences. Yet, they will play their part and riders who don’t own the best time trial or sprinting skills but aspire the overall victory will probably try to make their move in these stages. I’m certainly going to try as well, but much will depend on how the race unfolds itself." Lotto Soudal's sports director Frederik Willems knows that the final victory will be a matter of seconds, but knows that the team can tackle every challenge of the race. "Thanks to Tim Wellens, we were able to take the overall win twice," he commented. "It won’t be an easy edition as this year’s Tour will – even more – come down to details. Since there’s no stage in the Ardennes anymore, the overall victory will be determined by bonus seconds, especially in the first part of the race. Though, the final stage to Geraardsbergen, this year almost 220 kilometres in length may not be underestimated. And of course, we also have to take into account the typical Belgian weather that is predicted. "We have a strong and versatile team, which consists of riders for the overall victory, but also of strong sprinters to take a stage win in the several flat stages at the beginning. Regarding the GC, we have Tim Wellens, but also reigning European time trial champion, Victor Campenaerts, who I believe is capable of moving into the leader’s jersey after the time trial on Tuesday. He’s in really good shape as he prepared himself well for the European Championships by training hard and staying at altitude. If he manages to win the time trial, I consider him to defend the leader’s jersey for a long time. As for the bunch sprints, we can count on Jasper De Buyst and Jens Debusschere, who recently showed his fast legs again by sprinting to a stage victory in Tour de Wallonie."